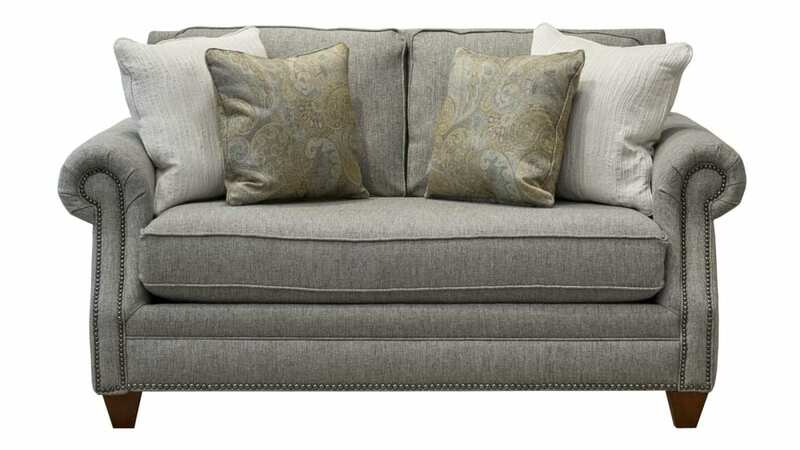 Made in America, this loveseat will bring a fresh, new look, as well as years of comfort and support, into your home. Take advantage of Gallery Furniture's same-day delivery service, and start enjoying this fantastic loveseat in your home TODAY! This loveseat was handcrafted by our fellow Americans and proudly Made in Texas. Soft, gunmetal grey upholstery blends with any decor while still making its own dramatic statement. Polished, pewter nailhead trim adds sophistication and eye appeal. Dacron-wrapped, foam cushion cores will provide years of comfort and great looks. Complementary accent pillows enhance the cultivated aesthetic.